BRANDON, Man. – The Ensemble Exchange, a chamber music group from Winnipeg, will launch the 2017-2018 Pro Series at Brandon University. Clarinetist Micah Heilbrunn, violinist Elation Pauls, cellist Minna Rose Chung and pianist Madeline Hildebrand will grace the Lorne Watson Recital Hall stage on Tuesday, Sept. 19 at 7:30 p.m. The programme will include works by de Falla, Albéniz, Piazolla and Sarasate, along with Clear Lake by Brandon composer and BU Faculty member T. Patrick Carrabré. The current principal clarinetist of the Winnipeg Symphony Orchestra, Heilbrunn previously held that position with Symphony Nova Scotia. A steadfast champion of new music, he has been on faculty at Brandon University, the University of Windsor and the University of Manitoba, and has appeared at several music festivals, including the Ottawa Chamber Music Festival and the Las Vegas Music Festival. The Assistant Principal Second Violin with the Winnipeg Symphony Orchestra for the past eight seasons, Pauls has performed in some of the most prestigious concert halls, including New York’s Carnegie Hall and Berlin’s Philharmonie. Also a busy teacher, Pauls is the artistic director and co-founder of the annual Rosamunde Summer Music Academy and Festival in Winnipeg. Along with teaching at the University of Manitoba, Chung performs around the globe as a recitalist, chamber musician, and with the Munich Symphony Orchestra on their international tours. She is a returning guest at several significant music festivals, including the Meadowmount School of Music in New York, the Santo Domingo Music Festival, and the Rio International Cello Encounter. A multiple prize-winner, Hildebrand has previously performed in Brandon and was the silver medalist at the 2013 Eckhardt-Gramatté National Music Competition, held on the Lorne Watson Recital Hall stage and hosted by the BU School of Music. “Many of us have fond memories of the Lorne Watson Recital Hall,” she said. “Micah recently performed the Brahms Clarinet Quintet with the Brandon Chamber Players, and I recently worked with BU faculty for their very playful evening of Menotti and More. The Ensemble Exchange concert is part of this year’s eight-concert Pro Series. Future performances include a Homecoming presentation with saxophonist Greg Gatien and pianist Michael Cain, on Thursday, October 12; the Cecilia String Quartet’s farewell tour stop in Brandon with guest clarinetist James Campbell, on Tuesday, October 24; a recital of piano gems featuring Douglas Humpherys, the winner of the first Gina Bachauer International Piano Competition, on Tuesday, November 7; and an evening with duo526 – violinist Kerry DuWors and pianist Futaba Niekawa – on Tuesday, November 14. In the new year, the Pro Series continues with an audience favourite – the Faculty Concert – on Tuesday, January 9; followed on Tuesday, February 13 by a recital with soprano Sarah Kirsch, the 2014 winner of the Eckhardt-Gramatté National Music Competition, along with pianist Chris Kayler; and to conclude, soprano Dorothea Hayley, clarinetist Catherine Wood and pianist Manuel Laufer present an evening inspired by nature, solitude and contemplation, on Tuesday, March 27. Also featured under the auspices of the Pro Series is the Brandon University New Music Festival, which returns on March 12 and 13, with an homage to Leonard Cohen and the connections between literature and music. 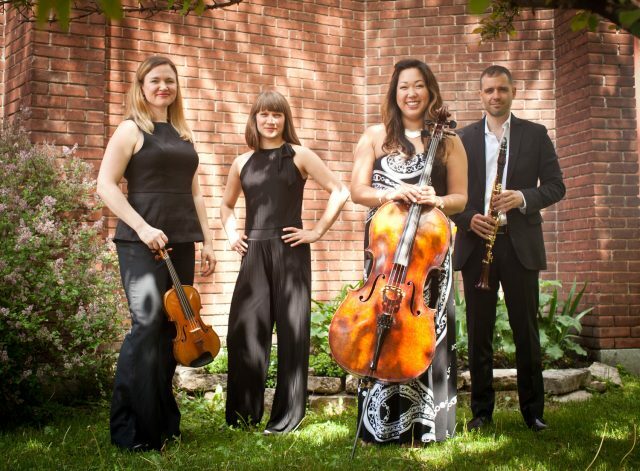 The Ensemble Exchange concert, featuring clarinetist Micah Heilbrunn, violinist Elation Pauls, ‘cellist Minna Rose Chung and pianist Madeline Hildebrand, will take place at 7:30 p.m., Tuesday, October 19, in the Lorne Watson Recital Hall, in the Queen Elizabeth II Music Building at Brandon University. Tickets are $15 for adults and $10 for students, seniors and alumni. Subscriptions are also available for the entire pro series and are $75 for adults and $50 for students, seniors and alumni. Tickets and subscriptions are available at the door or in advance in the Main Office in the School of Music.